While I had hoped for a gorgeous, sunny day when I visited the Wooden Shoe Tulip Farm last Sunday, Oregon weather flatly said NO! But I have to admit, I loved the way that the dark, stormy skies made the colors of the flowers pop. We did not get rained on the entire visit, despite the obvious threats from above. I love tulips... Gorgeous! That must have been magnificent to see in person! These scene will look good in any weather. I agree with Stefan, this scene would look gorgeous in any weather! Such beautiful colors and I think the gray, grumpy skies just accents the beauty of the colorful tulips!! Terrific capture! Thanks for sharing! Fantastic photo and I agree with Stefan! I like the stormy sky over the vibrant, beautiful tulips. Oh yes, the sky is the perfect backdrop for those vibrant flowers! beautiful fields of tulips. i'll keep this in mind for next year. The gray, stormy skies are in stark contrast to the vibrant show of color below! gorgeous! Wow, what a beautiful field of tulips! Lovely photo! You got a wonderful picture! I miss tulips ... and Oregon! What I would not give to be able to see this sight. Gorgeous. Such beautiful rows of color. I have seen so many snow photos it is good to see flowers. Poor snow bound states. Indeed beautiful! The clouds gave you color across the fields of tulips. I love tulips and your photo!! That is the best shot I have ever seen of massed tulips and the sky lends just the right colour effect. Often flowers are best photographed under a cloudy sky unless you photograph against the light. Love the contrast between gray sky and colorful tulips. Wow! I LOVE that photo!! 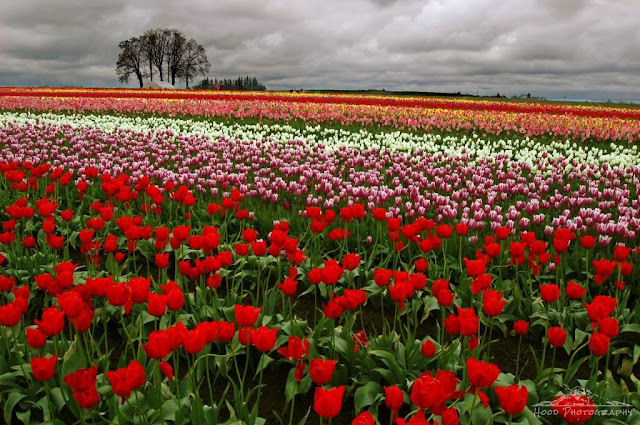 Stunning shot of the gorgeous tulips and the grey clouds. Oh my goodness! What a manificent picture of assorted tulips and their colors. You certainly brightened my day. This is a great photo... really beautiful!! How lovely! Happy sky watching. Heavenly shot! Bet that was a fun day!